Top leaders from 20 billion-dollar enterprises from various industries including AES Corporation, Walmart, GE Global, AT&T, IBM, PepsiCo, AIG, FedEx, etc. joined a Business Breakfast with Vietnam Prime Minister Nguyen Xuan Phuc in the framework of the 73rd session of the United Nations General Assembly. The Business Breakfast, co-hosted by FPT – a global leading IT service provider headquartered in Vietnam - and Business Council for International Understanding (BCIU), was the only business event with the Prime Minister throughout his trip, aiming to promote bilateral relationship on economics, investment and technology. Joining the Prime Minister are Vietnamese ministerial officials including Minister, Chief of Government Office; Minister of Industry and Trade; Minister of Health; Acting Minister of Information and Communications; Deputy Minister of Planning and Investment; Lieutenant General, Deputy Chief of General Staff of the Army of Vietnam; Vietnamese Ambassador to the US; and Ambassador of the Vietnamese delegation to the United Nations. Moderated by FPT Chairman Truong Gia Binh, the discussion on various policy frameworks and issues related to IT and investment in Vietnam has established opportunities for both sides to network, exchange views on business partnership and discuss about cooperation opportunities in the 4.0 Industrial Revolution. Emerging matters related to digital government, especially in e-Government and Smart City in Vietnam, caught special attention from US corporations. US enterprises’ concerns and problems encountered in the investment procedure in Vietnam were well demonstrated and resolved, thus opening up opportunities and accelerating successful businesses cooperation and investment in Vietnam. “Vietnam commits to creating favorable conditions, in terms of policies and other factors, for foreign science and technology organizations to cooperate in advanced technologies research and transfer to Vietnamese enterprises.” The Prime Minister affirmed. “With the young and mathematical-oriented workforce, Vietnam is prepared for the digital era”. Said FPT Chairman Truong Gia Binh. 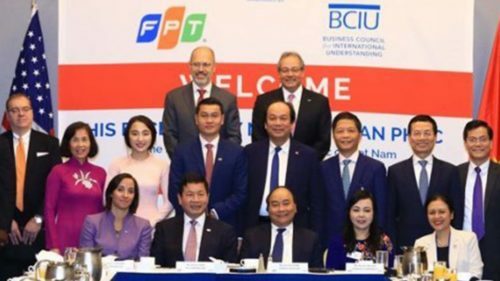 “FPT, as Vietnam's leading technology corporation, is ready to become one of the world’s Digital Transformation pioneers”.